This 2 bedroom 2 bathroom apartment (sleeps 4) is situated in a lovely peaceful development featuring well kept gardens and a large inviting communal pool. The apartment is beautifully furnished to a very high standard with air conditioning, fully fitted kitchen, 32' flat screen TV, DVD , Freeview channels, Wifi. The rooms are all very large with a large balcony that looks out on to the pool/garden area. It is suitable for families, couples/ singles, golfers & with lift access is suitable for wheelchairs & buggies. Vilamoura is only 25minute car journey from the airport. It has a wonderful vibrant Marina which has many restaurants, bars & shops. There is also a casino. The immaculate blue flag beaches are long with soft white sand. The combination of the superb apartment & the Vilamoura area will make for a fabulous holiday. Large luxury 2 bed apartment near beach & marina: This large apartment is located a 15 minute stroll from the Marina & beaches of Vilamoura. It is a straightforward 25 minutes journey from Faro airport to the apartment where the management company will be happy to meet you. They will welcome you into the apartment & show you all the facilities. The taxi fare from the airport is approx. 35 euros. The Marina is a vibrant place that has many very good restaurants & bars. It is a good place to sit & have a glass of wine & watch the holidaymakers stroll by. There is a casino that regularly has live shows. You will see some fabulous boats moored in the Marina, some of which can be hired. The 2 beaches, Falesia & Marina are long stretches of soft white sand. They have umbrellas & sun loungers that can be hired. There are several beach bars/restaurants that sit overlooking the sea. The apartment is one of the largest in the Praia Village development. With the beautifully manicured gardens & large pool area it feels like a peaceful oasis perfect for relaxing. The apartment is fully air conditioned. It has an entrance hall with a video entry phone. Leading from the over sized lounge is the fully equipped kitchen which has a bistro style table & chairs, fridge/freezer, washing machine/dryer, dishwasher, microwave, oven & hob. The lounge has large patio doors that lead out on to the balcony which is furnished with a table & comfortable chairs & looks on to the gardens & pool. The master bedroom has two single beds, dressing table, mirrors, wardrobe & patio doors leading on to the balcony. The 2nd bedroom is a very good size with 2 single beds, chest drawers ,mirror & wardrobe. The lounge has three 2 seater sofas.There is a 32' flat screen TV with free-view channels + DVD player and a selection of DVD's, dining table & 6 chairs. The apartment is very spacious. One of the great things with the apartment is its location. It really is a 15 minute stroll to the beach & Marina (3 minutes by car). We have provided sun loungers for your use around the garden & pool area. There is also a cool bag & ice packs that you are free to use. A hairdryer is also provided for your use. We request that on the day of departure the apartment is vacated by 10am & is available from 3pm on the day of arrival. This is to ensure that enough time is given to the maids to thoughrily clean the apartment. (Those while early arrival flight times may be able to gain early access if you contact me to arrange this. I will do my best to help you). With 2 sun loungers, Table and chairs for 4. All linen is provided. Towels are provided for use in the apartment (please bring towels for pool & beach use). Local English speaking management company on hand. Apartment is superb, exactly as described. We know the area anyway so we were looking for a place convenient for the marina but not too close to it. This was ideal. Great size rooms, excellent kitchen and lounge. Highly recommended. We will be back. Had a great holiday in this fantastic apartment! 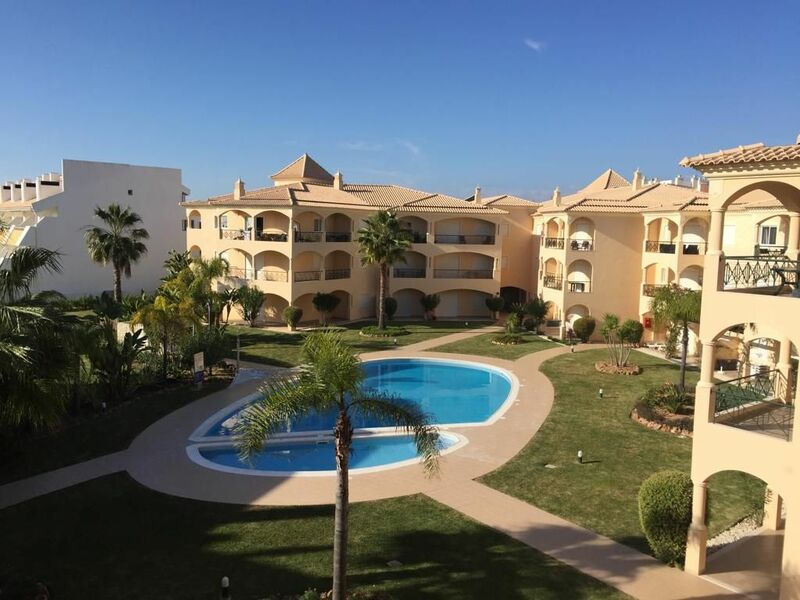 This huge apartment, with a great balcony, is in a lovely quiet complex which is ideally located and walking distance to the Marina and a beautiful beach. You can take a coastal walk from the Marina to Quarteria town where you will find shops and more reasonably priced restaurants where the locals go. Try the Street Kitchen great steaks and fish. The apartment has everything you need including hair dryers and the kitchen is one of the best equipped we have come across so no problem eating in, which we did a few times. Thanks Alan, we will definitely be back again. We’ve just returned from our weeks holiday at Alan’s apartment. Prior arrangements with Alan were spot on and the apartment was ideal for our family - two teenage girls and two adults. The apartment is 5*, very spacious, had all the required facilities and the pool area was ideal. Vilamoure shops and restaurants are a 10 minute walk and the Marina is lovely - plenty of choice and all restaurants are fairly priced. The beach is lovely and again only a 10 minute walk. Will recommend the apartment to friends and family - thank you Alan. Thanks Sian pleased you had a lovely holiday and would be happy to welcome you back in the future. Just back from a lovely 10 day family holiday in Villamora. Apartment was fabulous, everything you need and more to ensure you have a very comfortable stay. First visit to Villamora & Alan’s apartment and certainly not going to be our last. Vilamoura is a popular resort known for its beautiful beaches, fabulous golf courses & its large vibrant Marina. There are excellent tourist facilities & the Marina is surrounded by restaurants, bars & shops. There are two long, sandy blue flag beaches with loungers & umbrellas for hire. The beaches are easily accessed with ramps for buggies & wheelchairs. There are several beach bars/restaurants to relax & enjoy. There are many fantastic golf courses in very close proximity, including The Old Course, Millenium, Pinhal, Victoria & Laguna. There are two water parks within 3kms which the children will love & you can easily spend a day there. Locally there is horse riding, bicycle hire, fishing, wind surfing, diving,paragliding, dolphin trips, mini golf & tennis. There are nearby local markets selling fresh local produce & souvenirs. The night life of Albufeira is only 20 minutes drive. There is great shopping at the Algarve Mall & The Forum, Faro within a 20 minute drive. Golf: There are five top golf courses all within easy reach from the apartment. The Old Course, Pinhal, Millenium, Victoria & Laguna. Verbal bookings will be held for up to 7 days.20% non refundable deposit require on confirmation of booking and the balance 6 weeks prior to arrival. £150 refundable breakage/damage deposit is required with the balance. This will be refunded within 14 days of vacating the apartment in good order. We employ the services of an English & Portuguese speaking management company in Vilamoura.